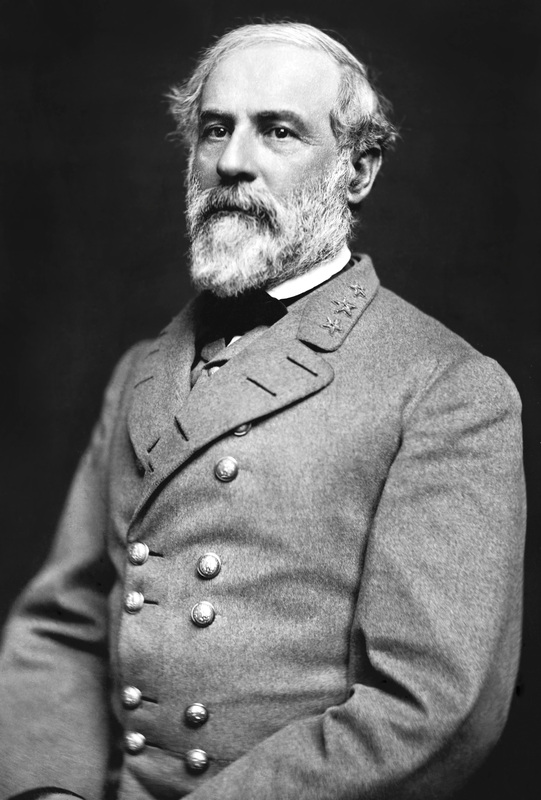 Robert E. Lee, the most well-known CSA general. Lee is shown with the insignia of a Confederate colonel, which he chose to wear throughout the war. These generals were most often infantry or artillery brigade commanders, aides to other higher ranking generals, and War Department staff officers. By war's end the Confederacy had at least 383 different men who held this rank in the PACS, and three in the ACSA: Samuel Cooper, Robert E. Lee, and Joseph E. Johnston. The organization of regiments into brigades was authorized by the Congress on March 6, 1861. Brigadier generals would command them, and these generals were to be nominated by Davis and confirmed by the Confederate Senate. These generals were most commonly infantry division commanders, aides to other higher ranking generals, and War Department staff officers. They also led the districts that made up military departments, and had command over the troops in their districts. By war's end the Confederacy had at least 88 different men who had held this rank, all in the PACS. Divisions were authorized by the Congress on March 6, 1861, and major generals would command them. These generals were to be nominated by Davis and confirmed by the Senate. Major generals outranked brigadiers and all other lesser officers. There were 18 lieutenant generals in the Confederate Army, and these general officers were often corps commanders within armies or military department heads, in charge of geographic sections and all soldiers in those boundaries. All of the Confederacy's lieutenant generals were in the PACS. The Congress legalized the creation of army corps on September 18, 1862, and directed that lieutenant generals lead them. These generals were to be nominated by Davis and confirmed by the Senate. Lieutenant generals outranked major generals and all other lesser officers. This rank was not synonymous with the Federal use of it; Ulysses S. Grant was one of only two Federal lieutenant generals during the war, the other being Winfield Scott who received a promotion to brevet lieutenant general by a special act of Congress in 1855. Grant was by the time of his promotion, March 9, 1864, the only Federal lieutenant general in active service. Grant became Commander of all the Unions armies, answering only to Abraham Lincoln and was charged with the task of leading the Union armies to victory over the Confederacy. The CSA lieutenant general rank is roughly equivalent to lieutenant general in the modern U.S. Army. The Confederate Congress passed legislation in May 1864 to allow for "temporary" general officers in the PACS, to be appointed by Jefferson Davis and confirmed by the Senate, and given a non-permanent command by Davis. Under this law Davis appointed several officers to fill open positions. Richard H. Anderson was appointed a "temporary" lieutenant general on May 31, 1864, and given command of the First Corps (following the wounding of Lt. Gen. James Longstreet on May 6 in the Wilderness.) With Longstreet's return that October, Anderson reverted to a major general. Jubal Early was appointed a "temporary" lieutenant general on May 31, 1864, and given command of the Second Corps (following the re-assignment of Lt. Gen. Richard S. Ewell to other duties) and led it until December 1864, when he too reverted to a major general. Likewise both Stephen D. Lee and Alexander P. Stewart were appointed fill to vacancies in the Western Theater as "temporary" lieutenant generals, and also reverted to their prior grades as major generals as those assignments ended. However, Lee was nominated a second time for lieutenant general on March 11, 1865, and was confirmed as such five days later . Originally five officers in the South were appointed to the rank of general, and only two more would follow. These generals occupied the senior posts in the Confederate Army, mostly entire army or military department commanders, and advisers to Jefferson Davis. This rank is equivalent to general in the modern U.S. Army, and the grade is often referred to in modern writings as "full general" to help differentiate it from the generic term "general" meaning simply "general officer". 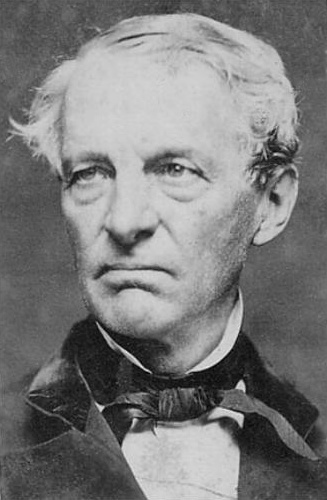 All Confederate generals were enrolled in the ACSA to ensure that they outranked all militia officers, except for Edmund Kirby Smith, who was appointed general late in the war and into the PACS. P.G.T. Beauregard, had also initially been appointed a PACS general but was elevated to ACSA two months later with the same date of rank. These generals outranked all other grades of generals, as well as all lesser officers in the Confederate States Army. The first group of officers appointed to general were Samuel Cooper, Albert Sidney Johnston, Robert E. Lee, Joseph E. Johnston, and P.G.T. Beauregard, with their seniority in that order. This ordering caused Cooper, a staff officer who would not see combat, to be the senior general officer in the CSA. That seniority strained the relationship between Joseph E. Johnston and Jefferson Davis. Johnston had been the only general officer in the U.S. Army who left for the South, so he considered himself the senior officer in the Confederate States Army and resented the ranks that Davis had authorized. However, his position in the U.S. Army was staff, not line, which was evidently a criterion for Davis regarding seniority and rank in the Confederate Army. On February 17, 1864, legislation was passed to allow Davis to appoint an officer to command the Trans-Mississippi Department, with the rank of general in the PACS. Edmund Kirby Smith was the only officer appointed to this position. Braxton Bragg was appointed a general in the ACSA with a date of rank of April 6, 1862, the day his commanding officer Albert Sidney Johnston died in combat. The Southern states had militias in place since Revolutionary War times consistent with the U.S. Militia Act of 1792. They went by varied names such as State "Militia" or "Armies" or "Guard" and were activated and expanded when the Civil War began. These units were commanded by "Militia Generals" to defend their particular state, and sometimes did not leave native soil to fight for the Confederacy. The Confederate militias used the general officer ranks of Brigadier General and Major General. The regulations in the Act of 1792 provided for militias into two classes based on age. Class one was to include men from 22 to 30 years old, and class two would include men from 18 to 20 years as well as from 31 to 45 years old. The various southern states were each using this system when the war began. All Confederate generals wore the same uniform insignia regardless of which rank of general they were, except for Robert E. Lee who wore the uniform of a Confederate colonel. The only visible difference was the button groupings on their uniforms; groups of three buttons for lieutenant and major generals, and groups of two for brigadier generals. The general officers of the Confederate Army were paid for their services, and exactly how much (in Confederate dollars (CSD)) depended on their rank and whether they held a field command or not. On March 6, 1861, when the army only contained brigadier generals, their pay was $301 CSD monthly, and their aide-de-camp lieutenants would receive an additional $35 CSD per month beyond regular pay. As more grades of general officer were added, the pay scale was adjusted. By June 10, 1864, a general received $500 CSD monthly, plus another $500 CSD if they led an army in the field. Also by that date lieutenant generals got $450 CSD and major generals $350 CSD, and brigadiers would receive $50 CSD in addition to regular pay if they served in combat. The CSA lost more general officers killed in combat than the Union Army did throughout the war, in the ratio of about 5-to-1 for the South compared to roughly 12-to-1 in the North. The most famous of whom is General Thomas "Stonewall" Jackson, probably the most well-known Confederate commander after General Robert E. Lee. Jackson's death was the result of a friendly fire incident at Chancellorsville on the night of May 2, 1863. Replacing these fallen generals was an ongoing problem during the war, often having men promoted beyond their abilities (a common criticism of officers such as John Bell Hood and George E. Pickett, but an issue for both armies), or gravely wounded in combat but needed, such as Richard S. Ewell. The problem was made more difficult by the South's depleting manpower, especially near the war's end. The last Confederate general in the field, Stand Watie, surrendered on June 23, 1865, and the war's last surviving general, Edmund Kirby Smith, died on March 28, 1893. 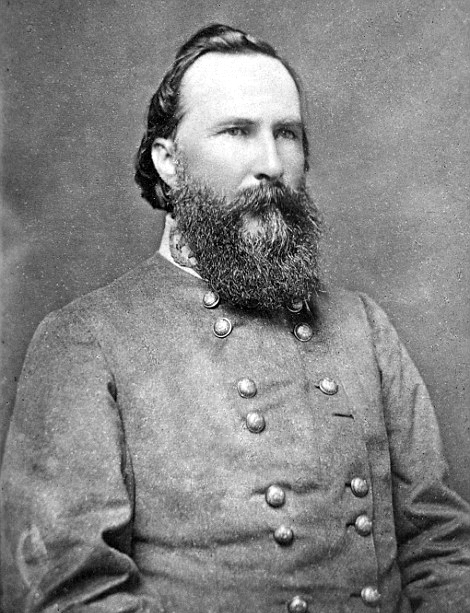 James Longstreet died on January 2, 1904, and was considered "the last of the high command of the Confederacy." ↑ Eicher pp. 24-5. This resulted from the Confederacy's adoption of the U.S. 'Rules and Regulations of the Army' as their own, just with "Confederate States of America" put in wherever "United States of America" was in its text. ↑ 2.0 2.1 2.2 2.3 2.4 Eicher, p. 23. ↑ Eicher, p. 23. "Actually, commissions in the ACSA were usually one grade higher than the former commissions in the U.S. Army, while commissions in the PACS usually amounted to whatever was suggested by the size of the volunteer unit accepted into the Confederate service." ↑ 5.0 5.1 Eicher, p. 24. ↑ Wright, p. 9. Confederate Congress Act of 16 May 1861, section 2. ↑ 8.0 8.1 8.2 8.3 8.4 8.5 8.6 8.7 8.8 Eicher, p. 807. ↑ 10.0 10.1 Eicher, p. 810. ↑ 12.0 12.1 Wright, p. 13. Confederate Congress Act of 31 May 1864. ↑ 13.0 13.1 13.2 13.3 13.4 13.5 Eicher, pp. 787-8. ↑ The usage of the somewhat incorrect term "full general" is very unofficial, but commonly occurs in modern military writings; referring to a colonel as "full" and/or "bird" colonel (as compared to a lieutenant colonel, who ranks behind them) in U.S. forces also occurs. ↑ Wright, p. 13. Confederate Senate Resolution, 16 March 1865. ↑ Eicher, p. 69. The original regulations for uniforms were issued at the time that only brigadier generals were authorized by Congress. These regulations apparently were never reissued when the higher ranks of generals were authorized at later dates. ↑ Foote, p.1040. Of 583 Union general officers, 47 killed due to combat; of 425 CSA general officers, 77 fell. ↑ Dupuy, p.346. "an excellent brigade and divisional commander, he was out of his depth with larger commands." ↑ Dupuy, p. 597. "his abilities were not suited to directing larger forces, as demonstrated at Five Forks." ↑ Dupuy, p. 244. "but it was a mark of the South's desperation for able leaders that a man with his disabilities should have spent so much time on active campaign."